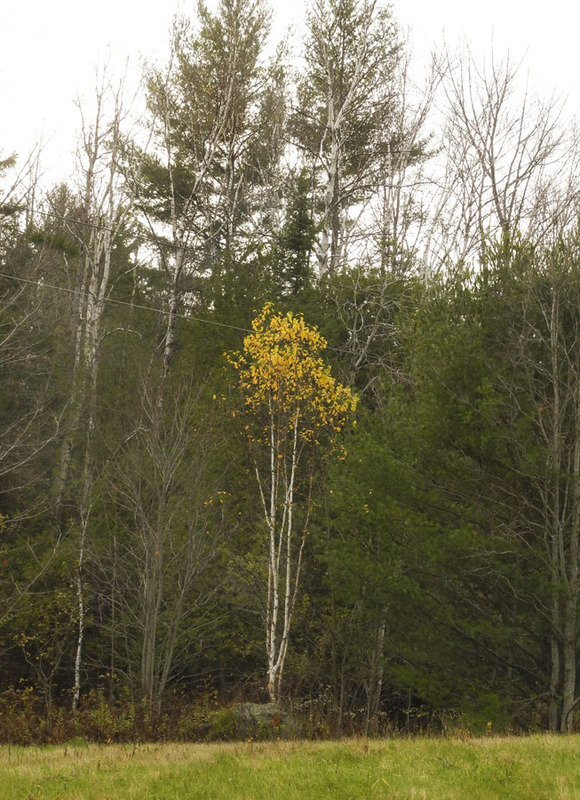 We're almost into November, the month of subtle grays in the landscape, but there is still color after a mild October. 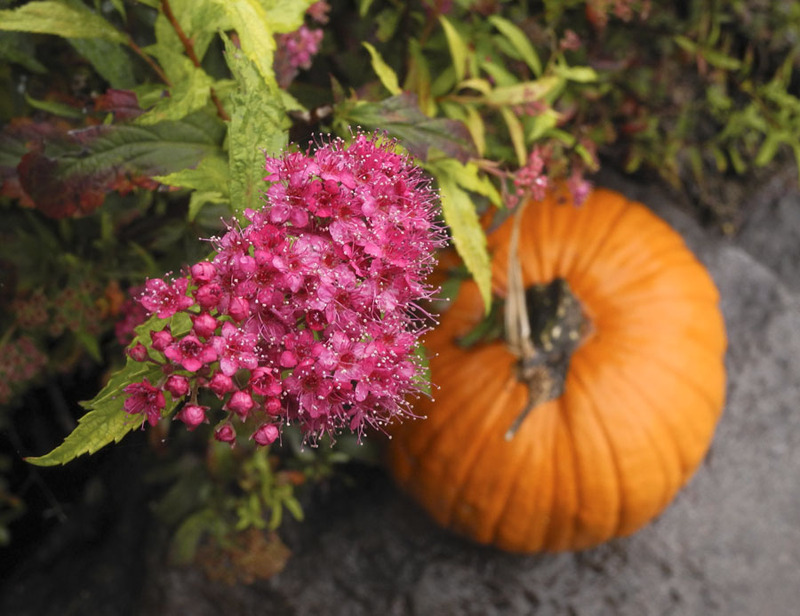 The spirea alongside my front steps is full of blooms. 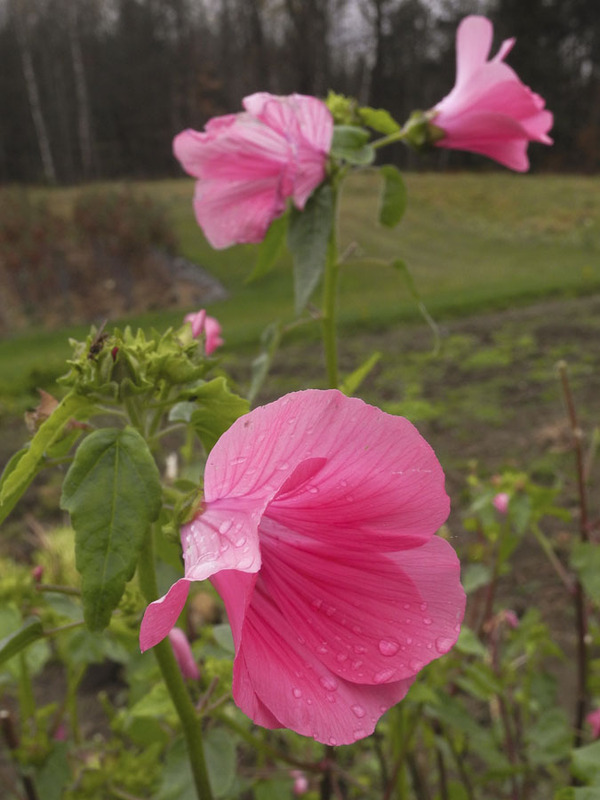 The lavatera in the vegetable garden survived the frosts of mid September and has been flowering cheerily since. These flowers are such late season gifts. 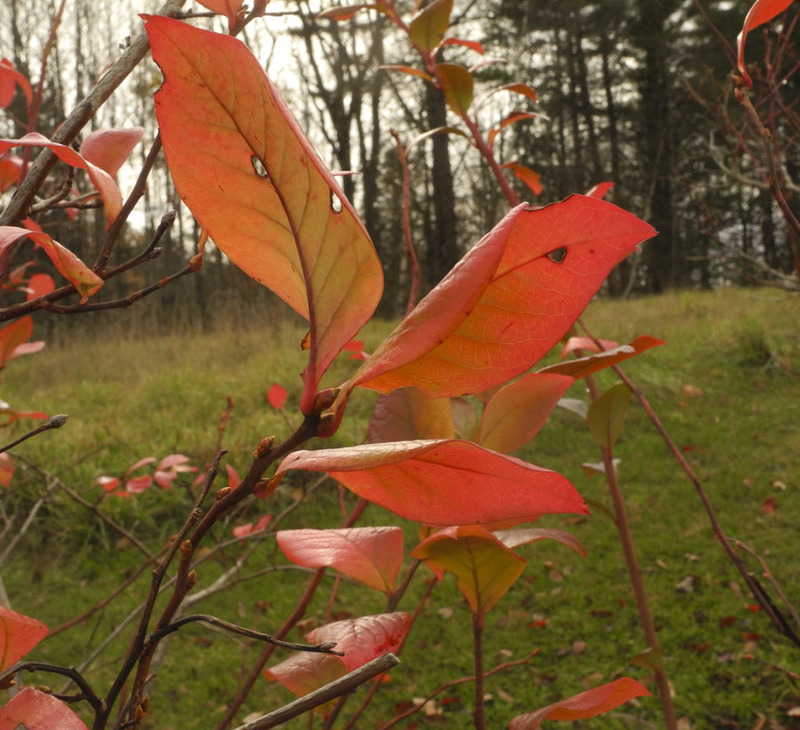 A few flaming leaves hang on to the blueberry bush. 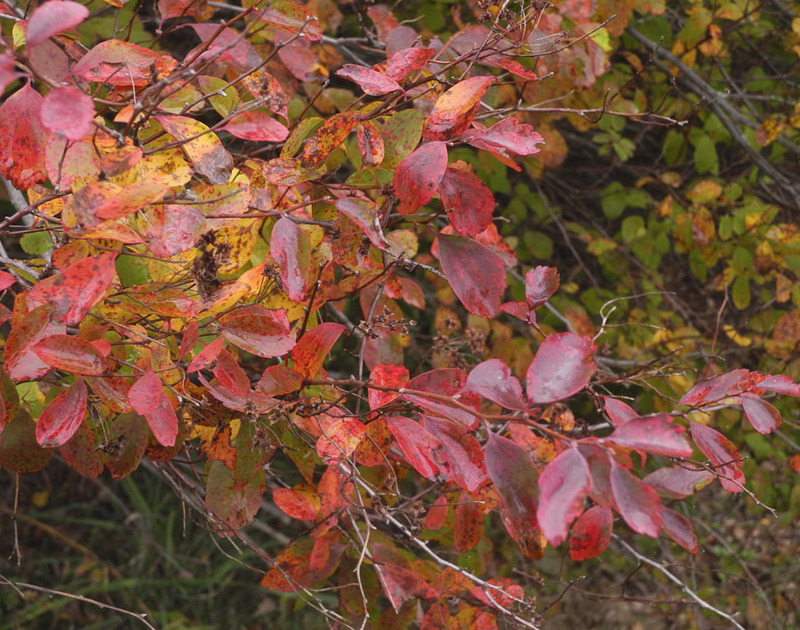 Although most of the shrubs and trees are now bare of leaves, some remain, such as the rich red ovals of the Bridal Wreath spirea. 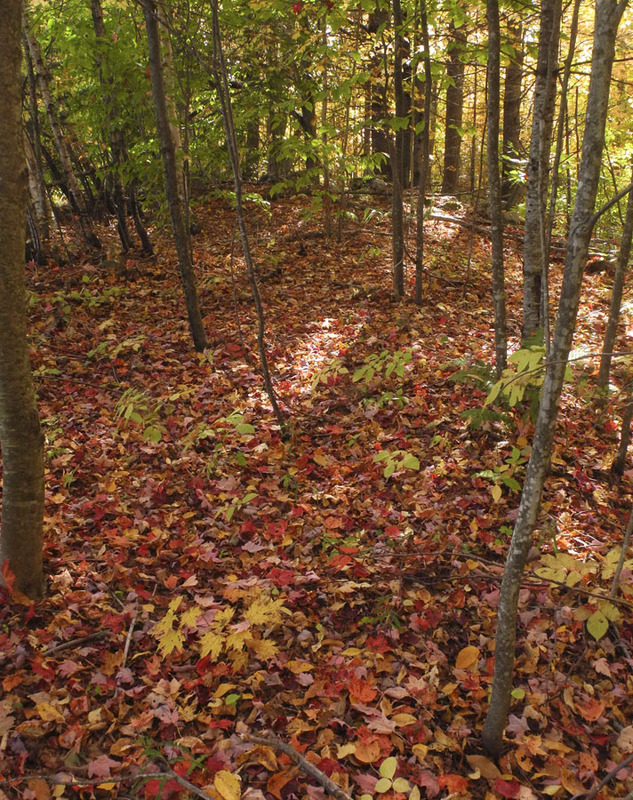 In the woods and on the tree covered hillsides the reds are gone; what remains is golden yellow. 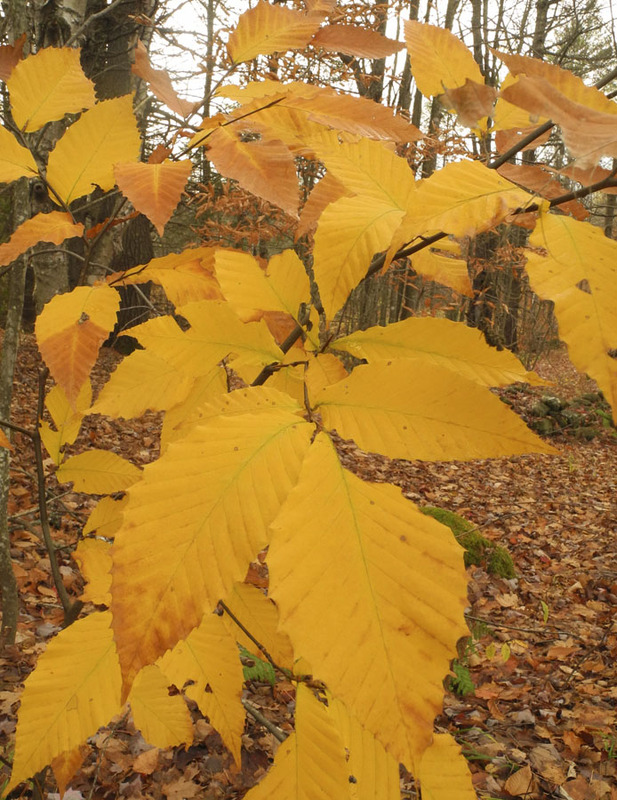 The beech leaves stand out amid the gray in their gold-moving-toward-warm-brown hue. 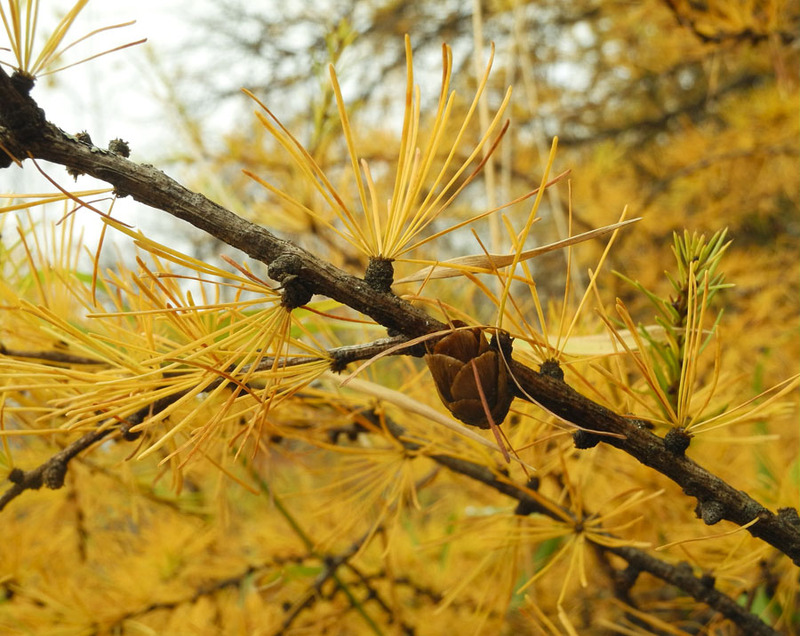 ....or from a favorite tree, the tamarack. 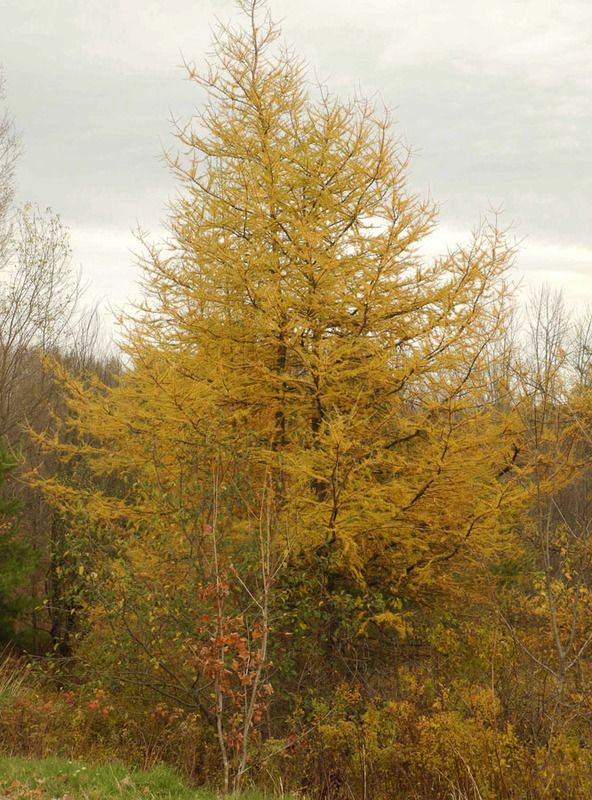 Tamaracks are unusual in that they are deciduous conifers; they turn a deep gold in the fall, then lose their needles. In this landscape view, the pointed spires of tamaracks are in the middle ground; in the distance the rounded yellows are birches. I love seeing these trees in my lower field; there is something completely magical about a tree with needles and cones turning yellow. It is nature surprising us, as it does again and again. 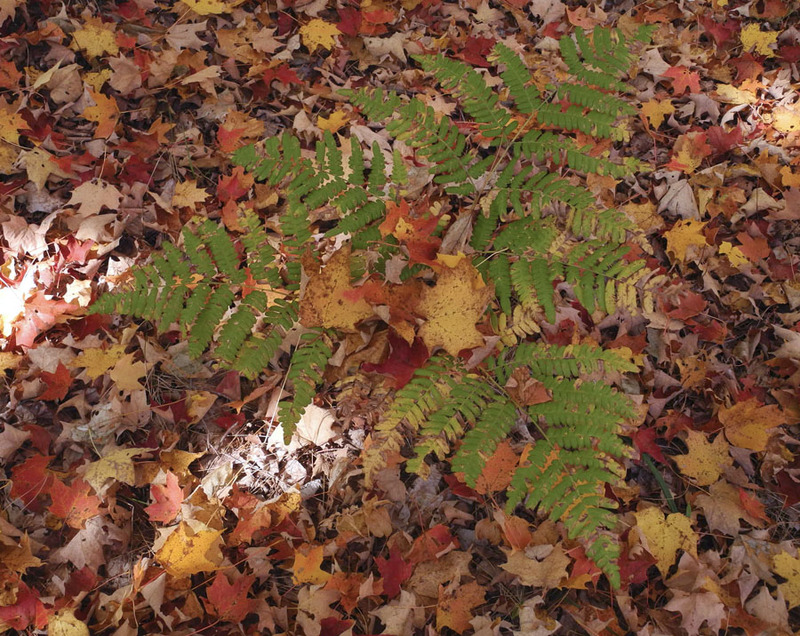 Each season, and each transition between them, has its wonders and delights. 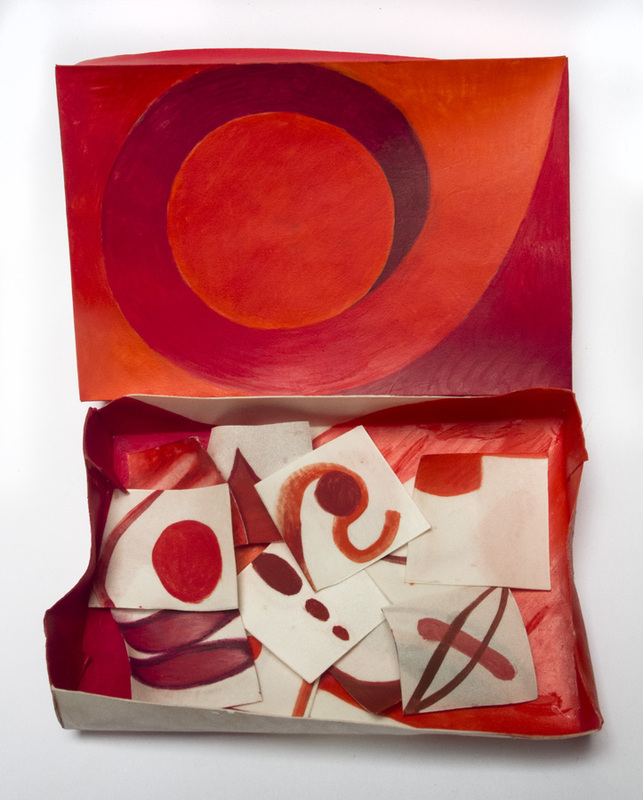 Reds, egg tempera on calfskin parchment; 3 1/2 x 5 in. For this latest in my series of boxed paintings––tiny paintings contained in a box (you can see a couple of previous ones here and here)––I worked with the theme of the color red. I used the various red pigments that I have: different hues of cadmium red including vermillion, medium, purplish; alizarine; earth reds. 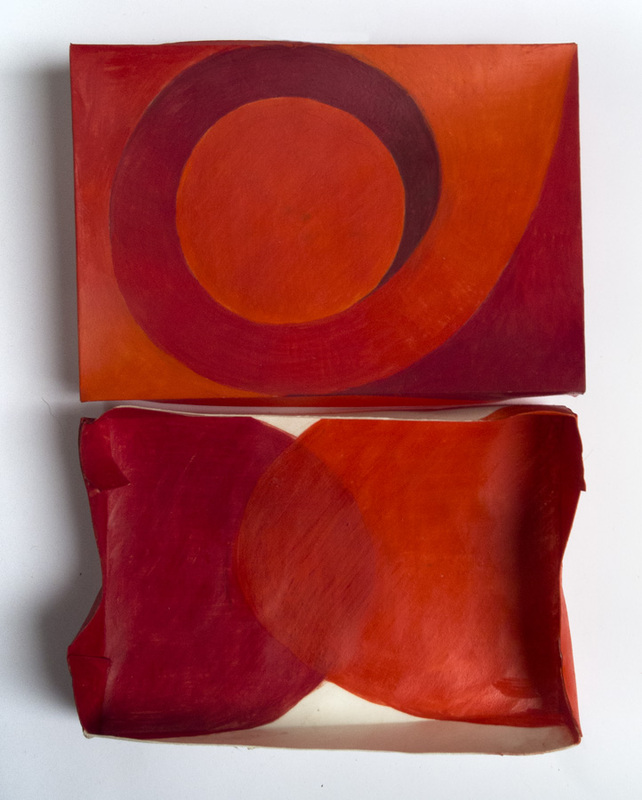 Because I think of red as a color linked to organic life via blood, I used curvilinear forms for the box and the small paintings, trying to stick with an organic theme. For the cover a circle within curves, for the bottom of the box two ovals overlapping. Reds, paintings side 1; each ca. 1 1/4 x 1 1/4 in. The parchment is translucent, so the painting on one side is often visible on the other; I take this into account when painting these tiny pieces, trying for a relationship between the two sides. 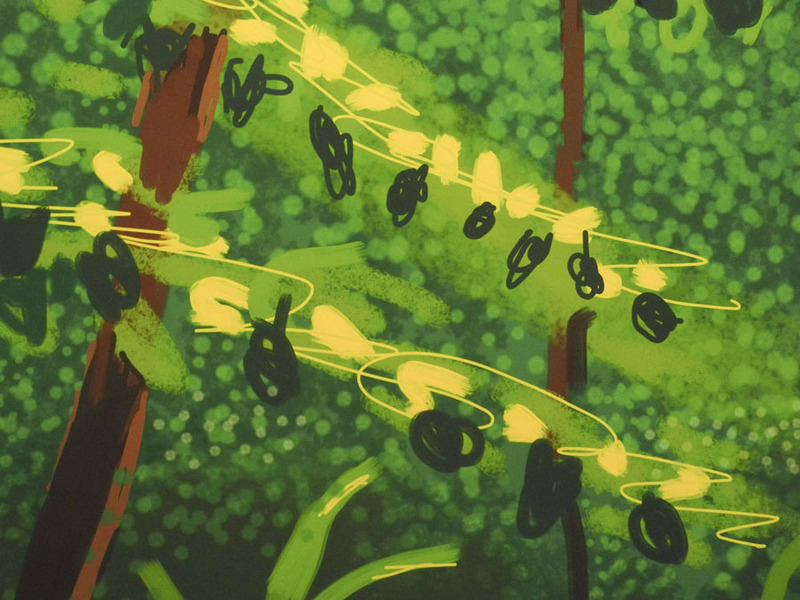 It wasn't easy for me to stick to somewhat organic shapes––I have a strong affinity for the geometric, hence the circles and ovals––but it was fun trying. 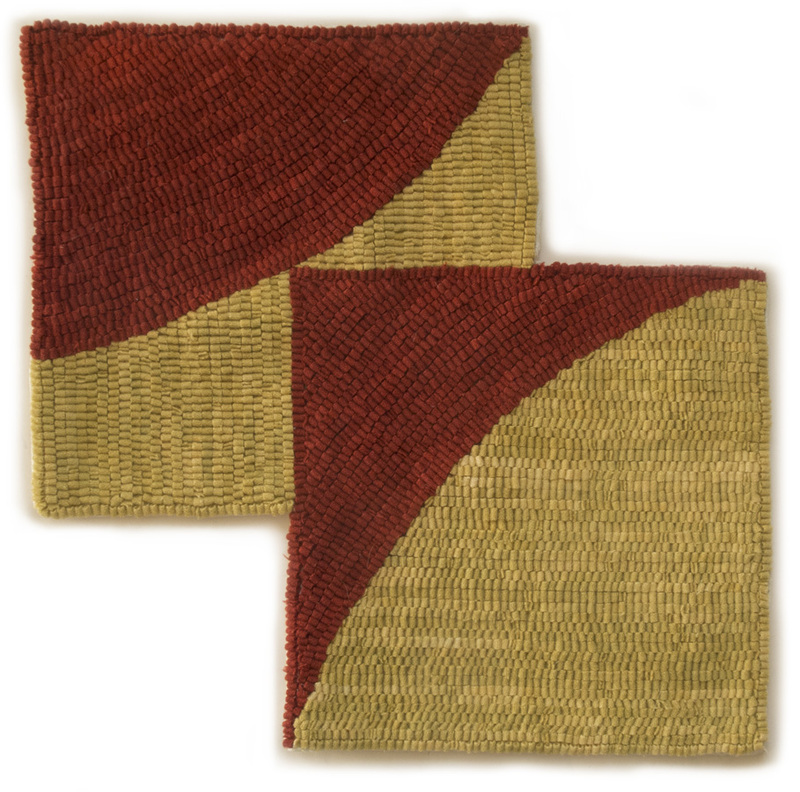 Arced Double Square, hand dyed wool on linen, 15 x 15 in. 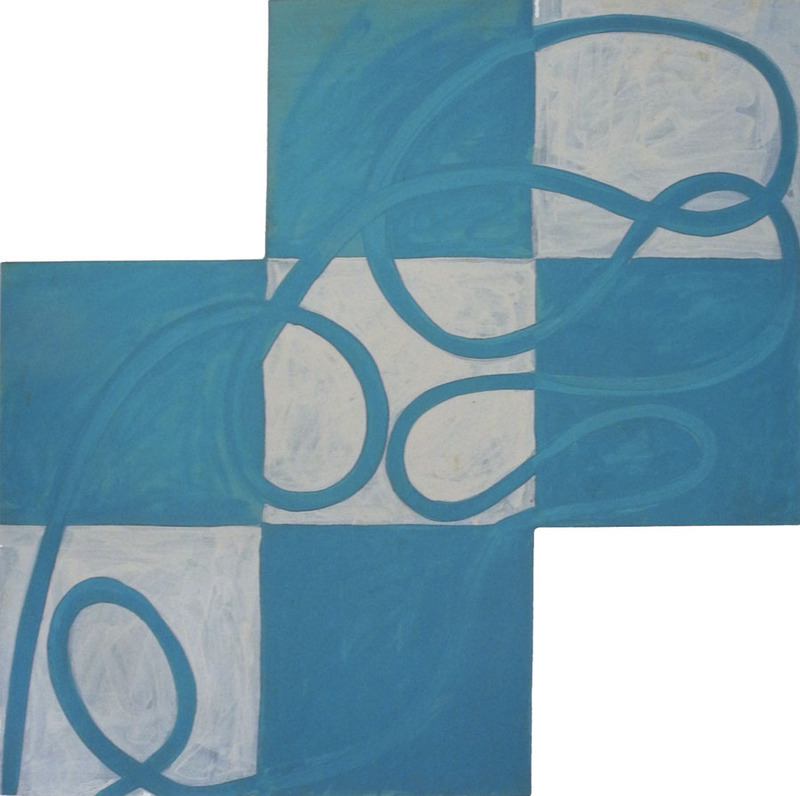 This piece, made up of two squares overlapping at their center, was inspired by similarly formatted paintings by Mary Heilmann. It is flat like her paintings, made up of a shaped surface. I chose curves to play off against the square shapes. 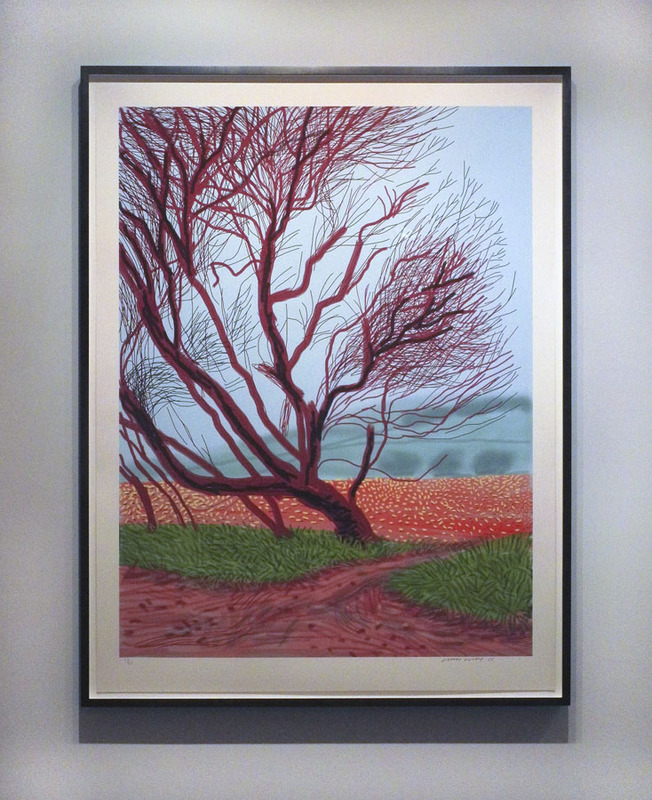 It wasn't until I'd started working on the piece that I noticed that its colors and theme were similar to my most recently completed painting, Red Arc, an unconscious influence. 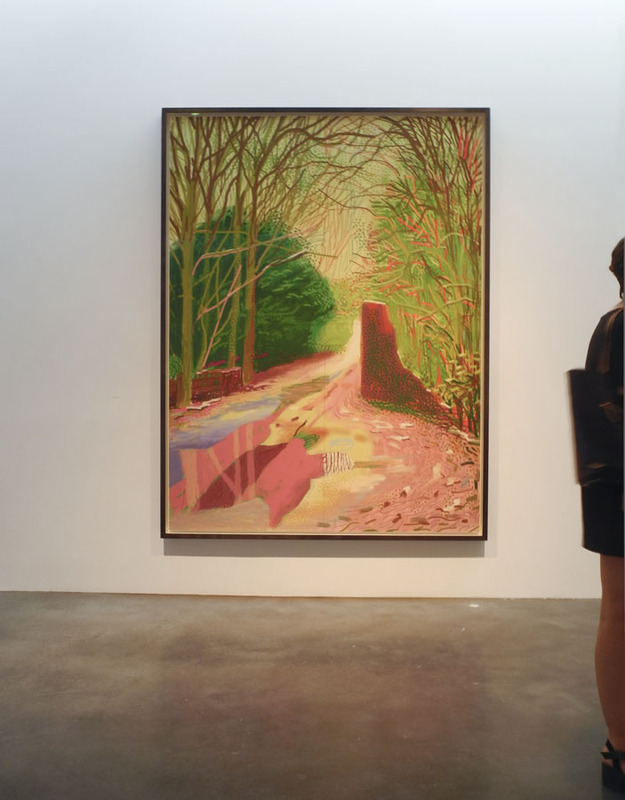 Mary Heilmann, Lupe, 1987; oil on canvas, 54 x 54 in. 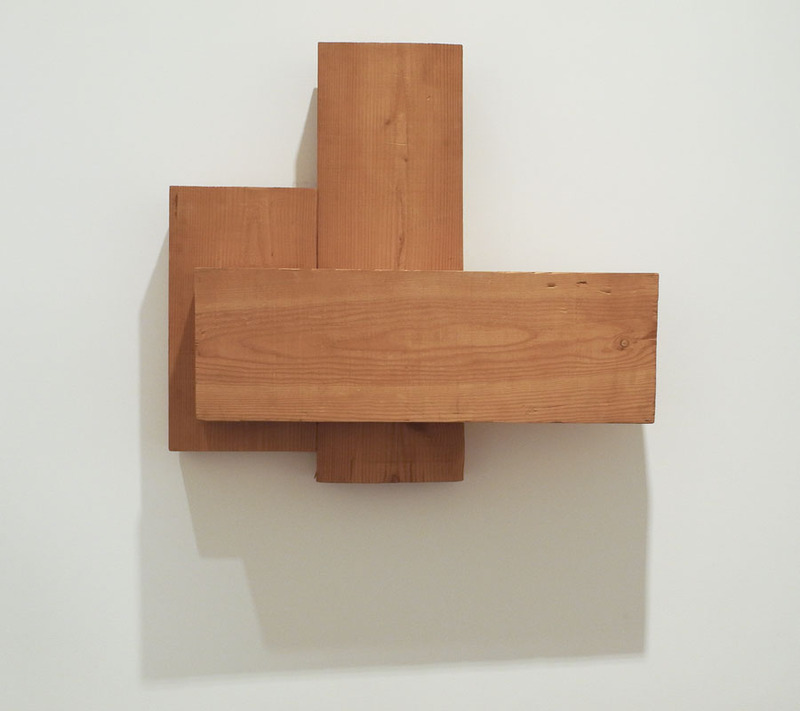 In Lupe, Heilmann divides the shaped plane into equal squares, with looping lines wandering across them, tying them together. In this detail image you can see that although there might be an illusion of one square overlapping another, the piece is flat. I wanted to have a point of tension where the square meets the curve, as though it is pricking the rounded line. One curve flows outward and one inward, which I hope sets up a balance of forces, the dark red shapes taking precedence over the yellow. 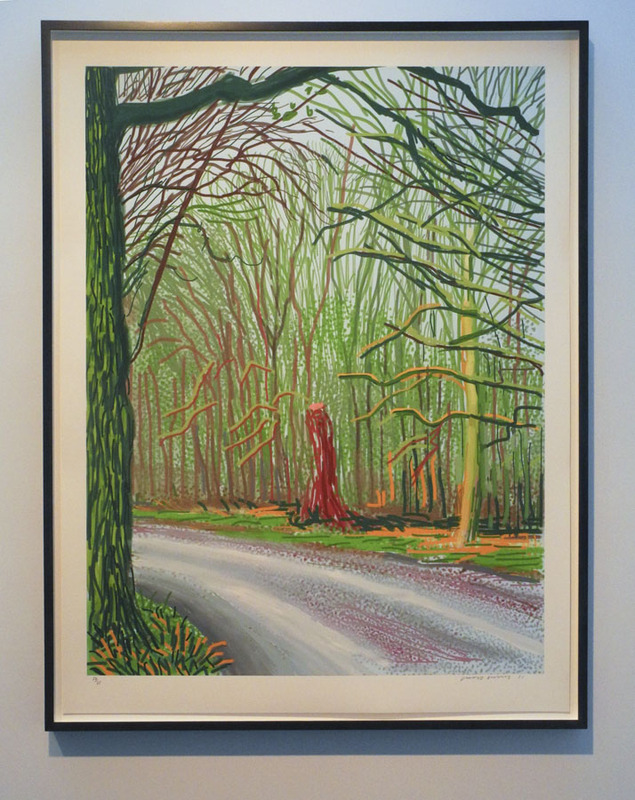 I am grateful to Heilmann, who is a marvelous painter, for starting me off on this format. When I got home yesterday after 8 days away and looked out toward the vegetable garden I could see that something was amiss: leaves were missing. 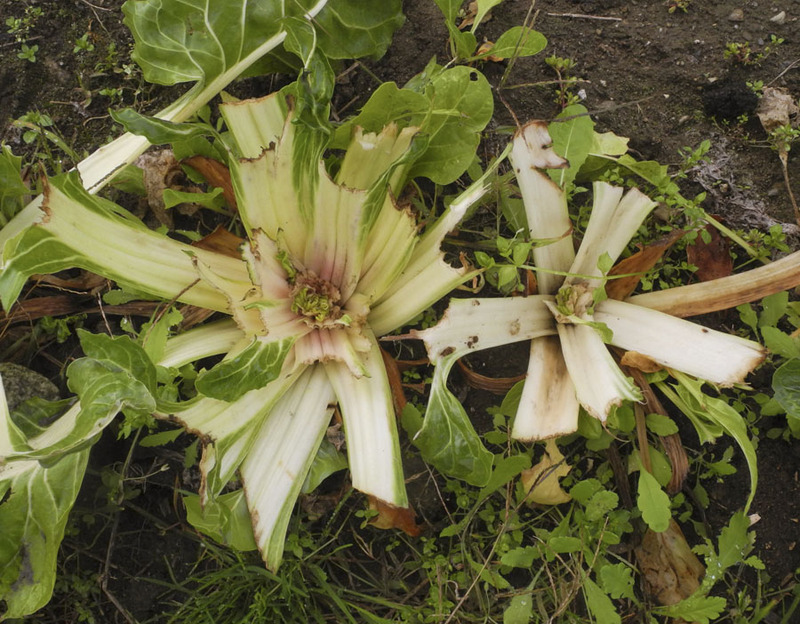 The full broad leaves of the brussels sprouts had been chewed away, though happily the sprouts were untouched. 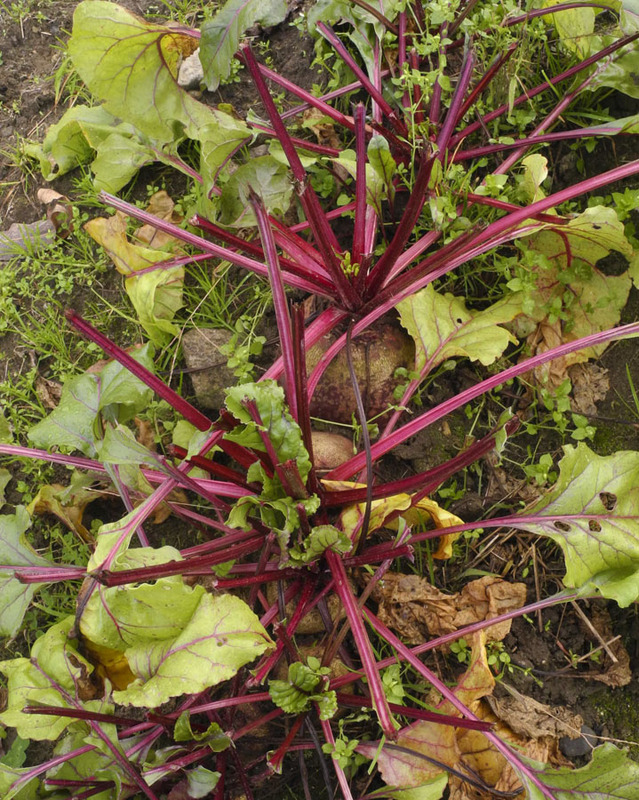 .....as was the swiss chard. 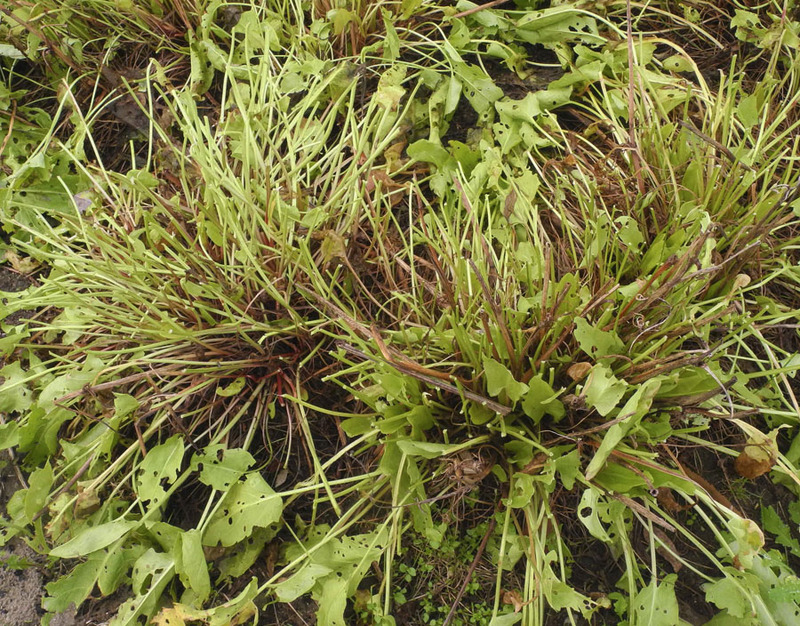 The beets remain, but not their greens. 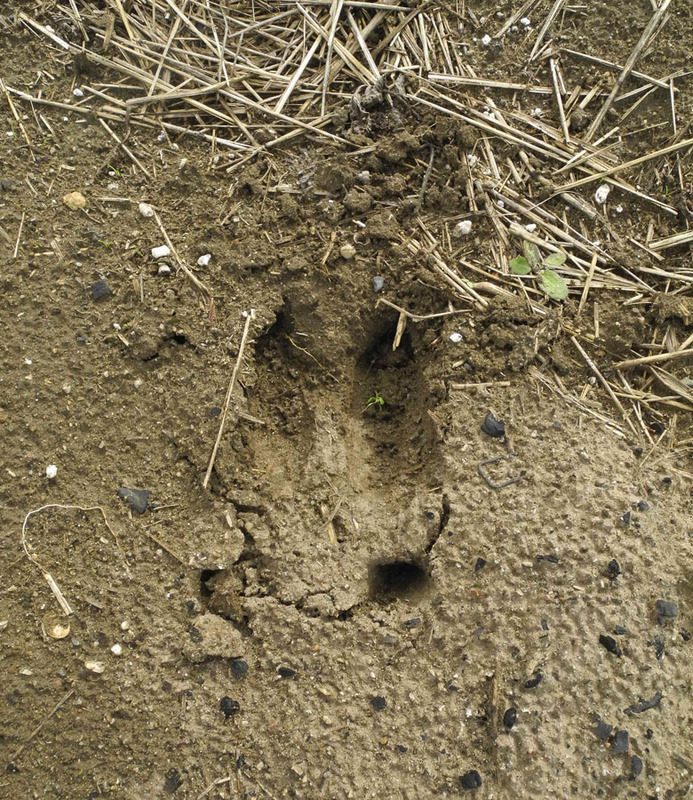 ....and those of a small one, perhaps a doe and her young offspring. 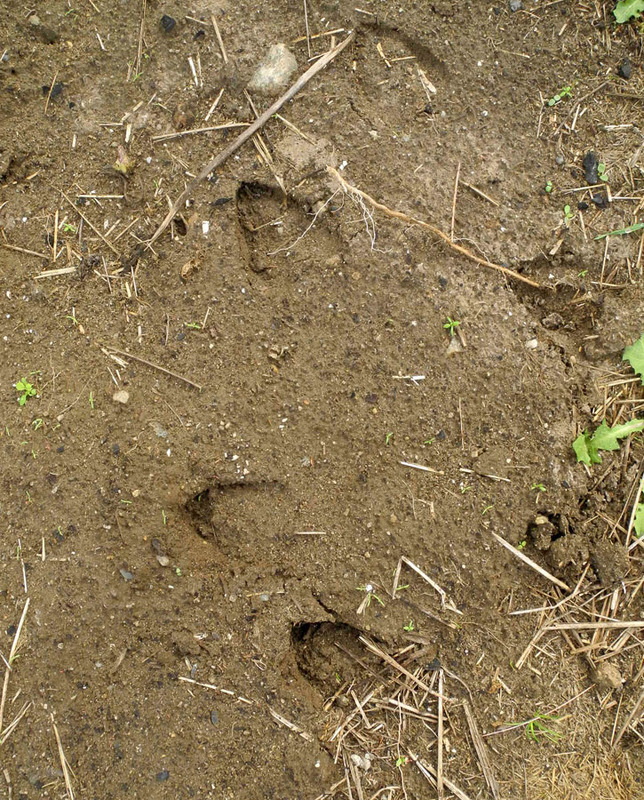 At the very end of the garden season, sometime in later November, I lower the electric fence and invite the local deer in to finish what remains; but I'm not yet ready to do that, so I put some fresh packets of peanut butter on the fence: if a deer goes close for a taste, a little shock will tell her "not now". 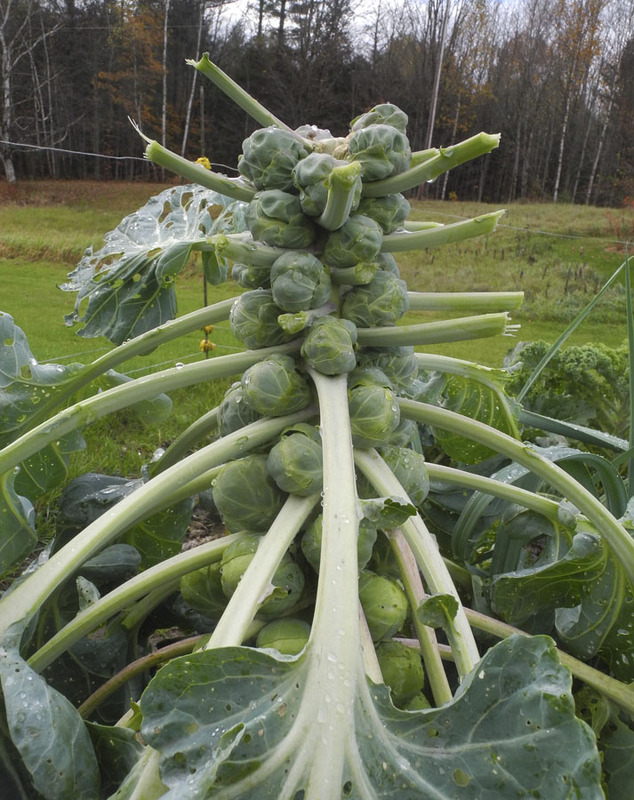 My animal neighbors will have to wait a while longer for their treat, and meanwhile, brussels sprouts for dinner! 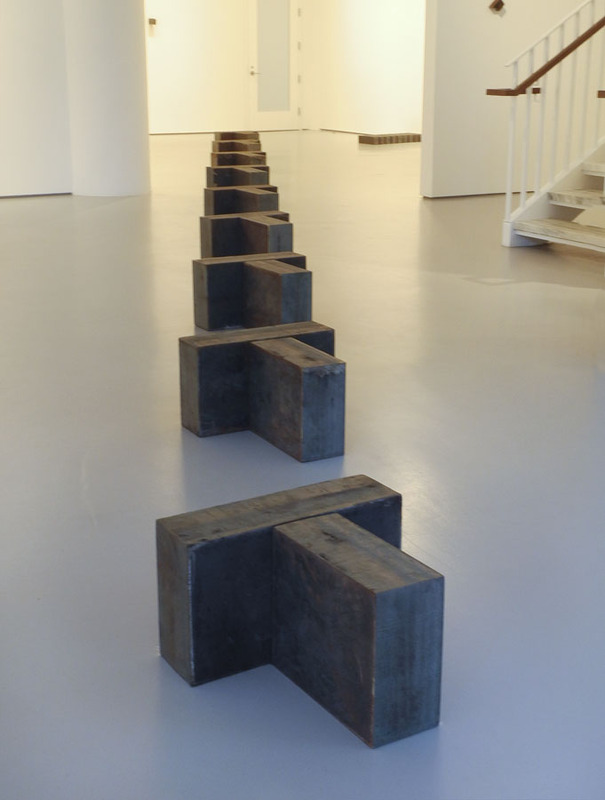 On my recent visit to NYC, my favorite gallery show was the sculpture of Richard Nonas at Fergus McCaffrey. 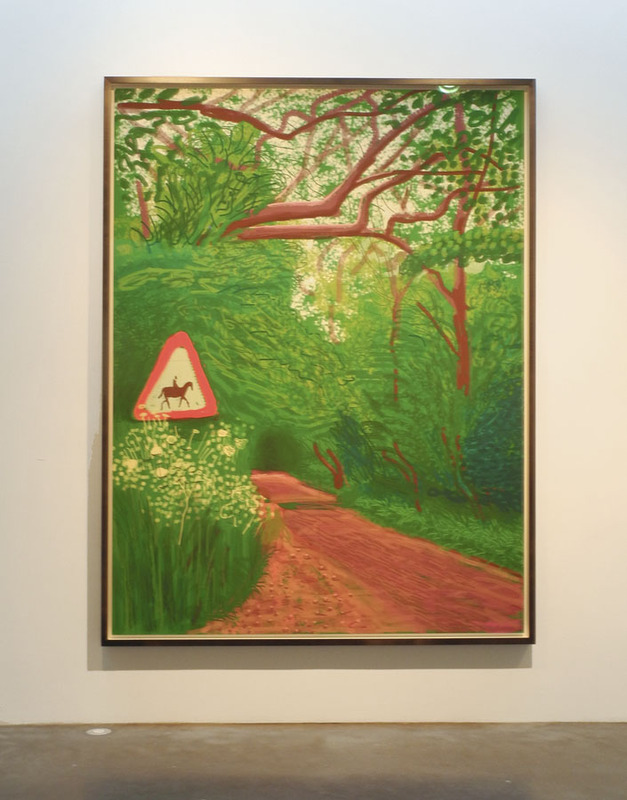 The show was a retrospective of sorts, with work spanning the years 1970-2014. 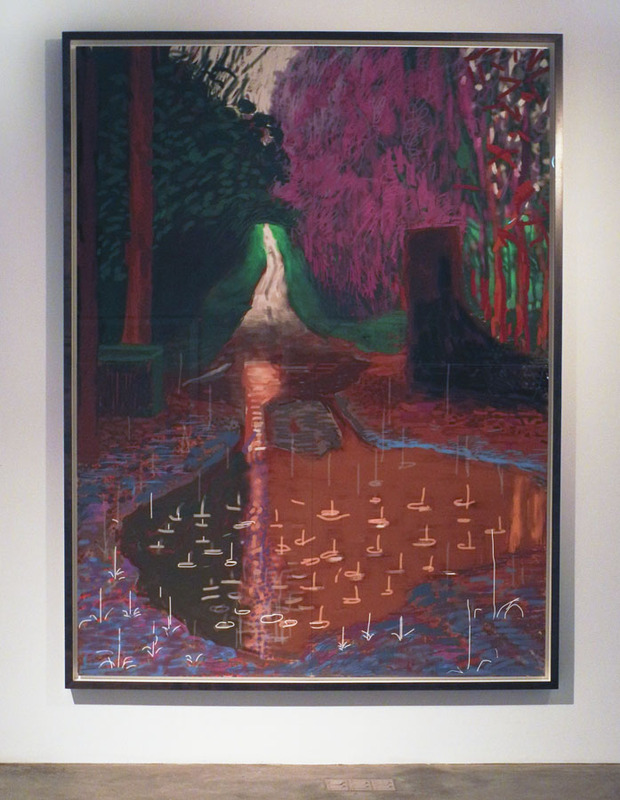 I don't know how I've missed seeing his work all these years; this was the first I've seen of it, and I loved it. 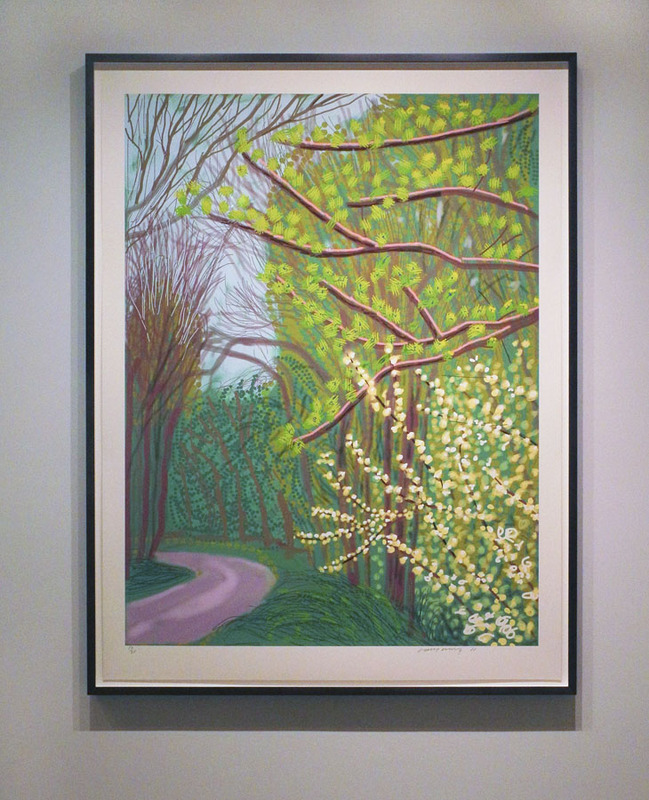 There is a consistent vision throughout, a minimalist sensibility, with work modest in size and large in ambition. When I began processing the photographs that I took at the gallery, I noticed what must have been subconsciously clear to me while there: these small pieces were as much about the space around them as the solid forms themselves. 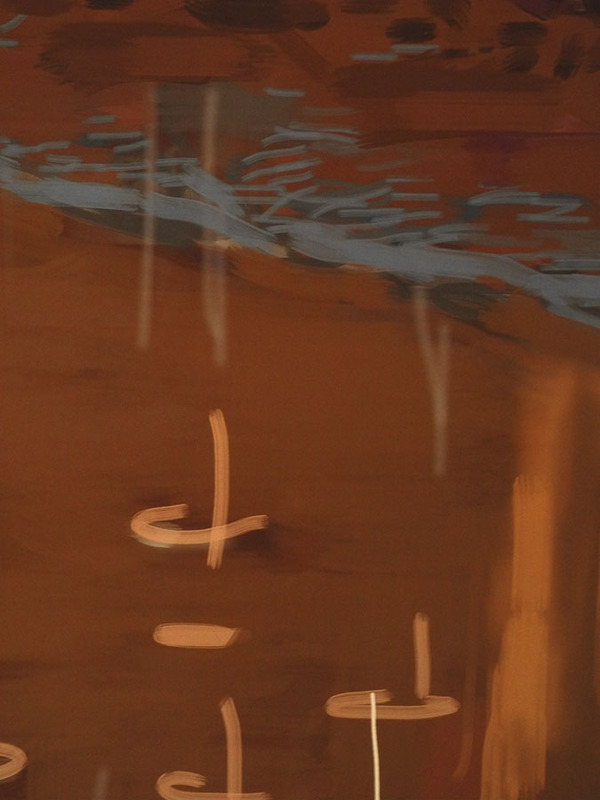 Rather than focus on closeups of each work individually, I photographed much of their surroundings. The work above was on the wall alongside the staircase to the second floor; the way it was hung animated the wall, as though encouraging an upward movement. It is such a simple idea: two triangles abutting so as to create an irregular edge, with that empty rectangle creating energy. 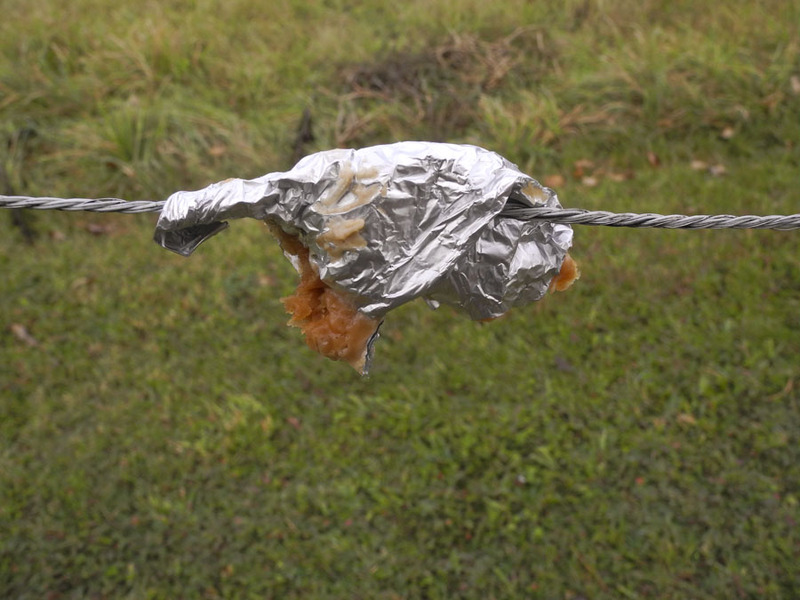 Untitled, 2014; steel; Part 1: 9 x 8 x 4 1/2 in. ; Part 2: 8 x 8 x 4 1/2 in. 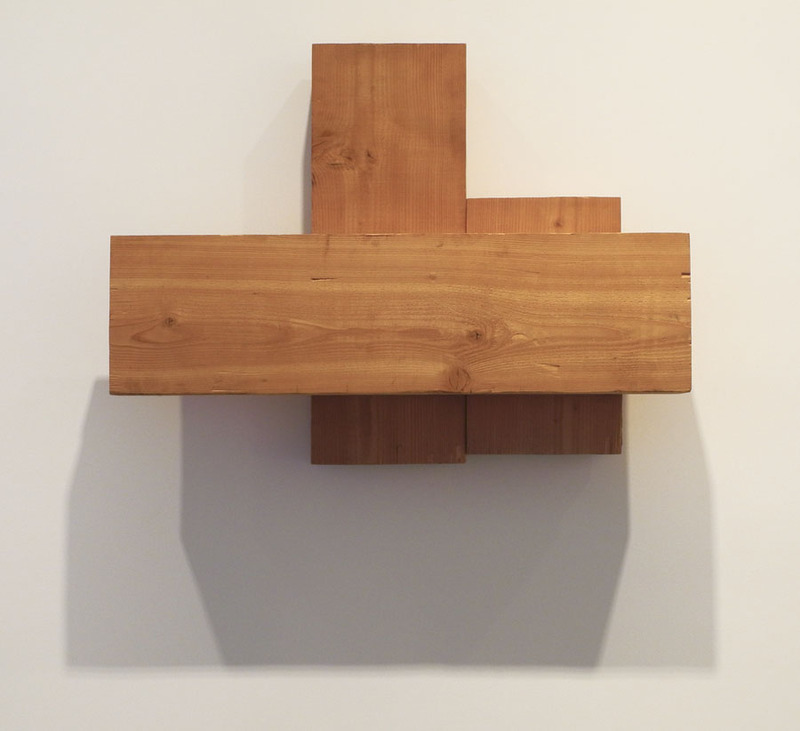 Two pieces made up of a horizontal and vertical rectangular solid, seemingly the same though turned 90 degrees. But no, the left part is slightly longer than the right; and the jutting rectangle on the right is not centered on its vertical. These slight variations, along with the major one of orientation, have our eye moving back and forth, jumping from one element to the other in a lively interaction. 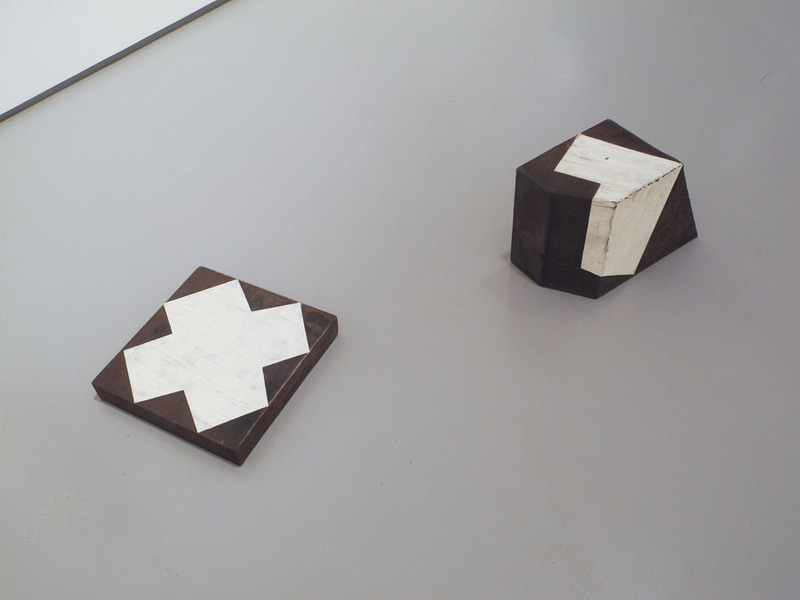 Untitled, 1987, Untitled, 1986; oil paint on steel; 12 x 12 x 2 in; 9 1/4 x 8 3/4 x 6 3/4 in. White paint on steel brings attention to surface and to the planes of the sculpture. A cross, so close to the floor, seems to levitate; a white shape moving across and irregular solid emphasizes its volume. 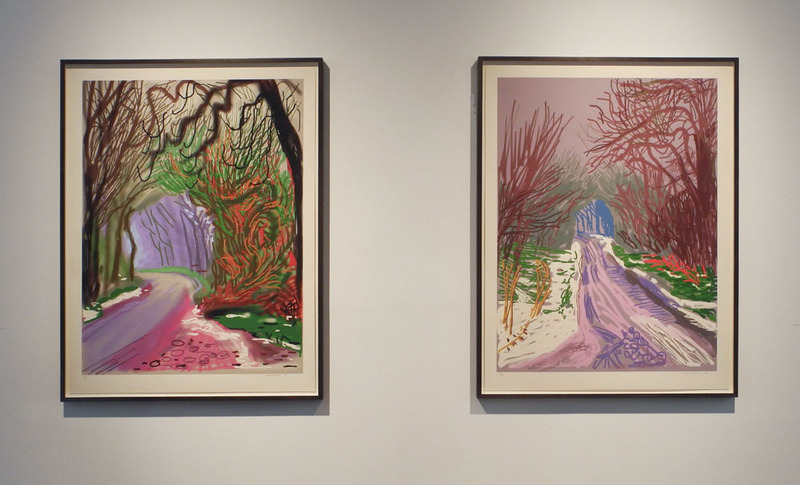 The two pieces together are engaged in an interesting conversation. A few small pieces were installed in a space under the staircase. 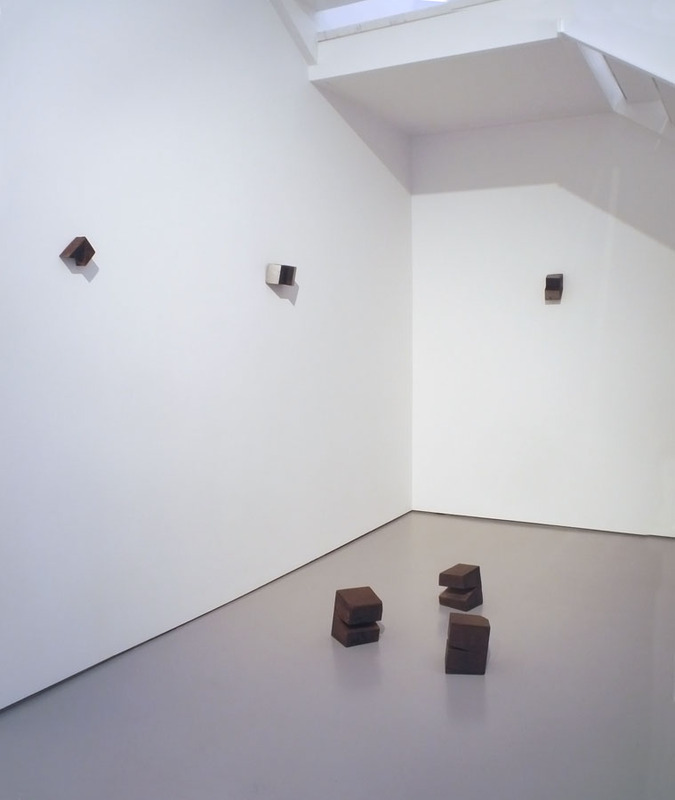 The floor pieces are especially lively, looking like they are jabbering with each other. 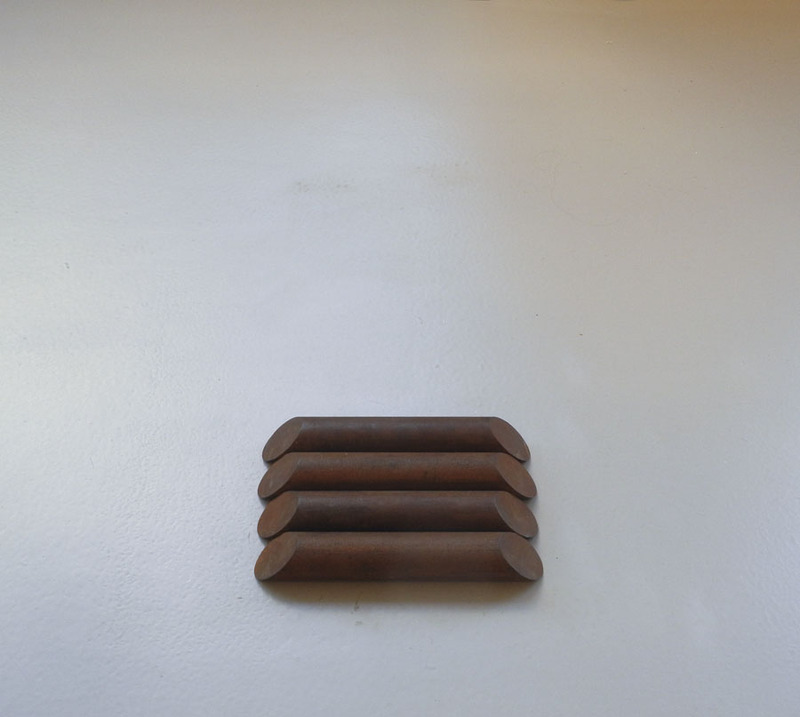 Skid (New-Word Chaser Series), 2014; steel; 9 parts, 41 ft and 6 in long, each: 20 x 20 x 12 1/4 in. Nine identical parts go shooting across the gallery from one room into another. One thing that's so interesting about this work is that steel is usually used for enormous, monumental sculpture. 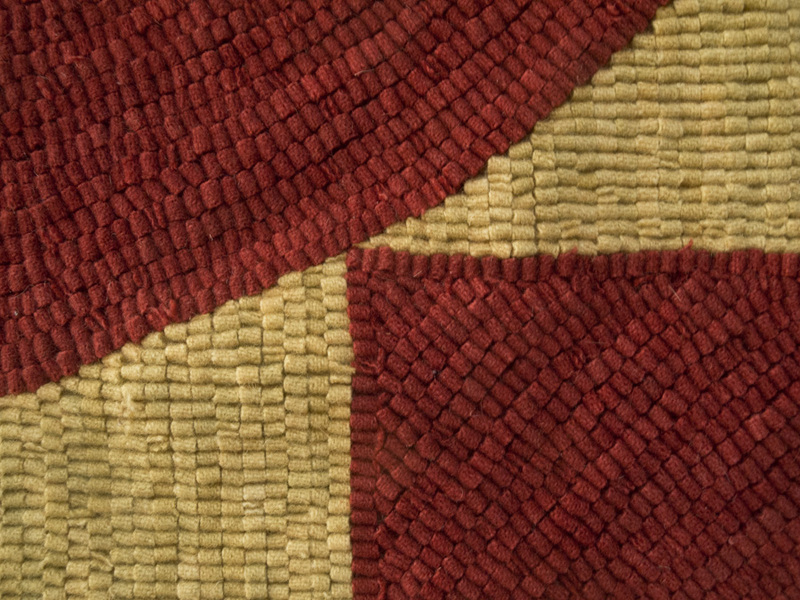 Nonas shows us that the material has great beauty of surface and great emotional weight at a small size. We follow these "T" shaped pieces as though they are friendly signs leading us onward. 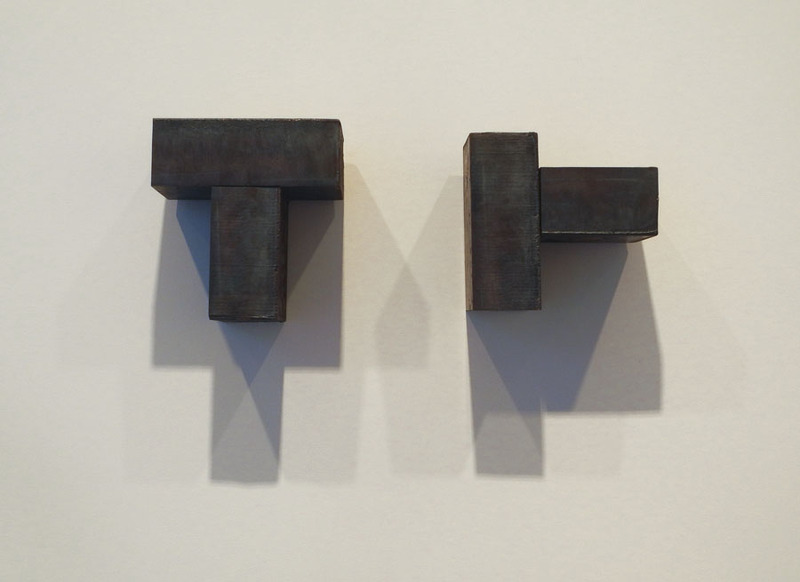 Untitled (First Series), 2014; steel; 6 1/2 x 4 x 4; 4 x 6 1/4 x 4; 7 1/4 x 6 x 4 1/4; 6 x 4 x 4 in. Instead of being enveloped by steel, as in the work of Richard Serra, we have an intimate relationship with it. 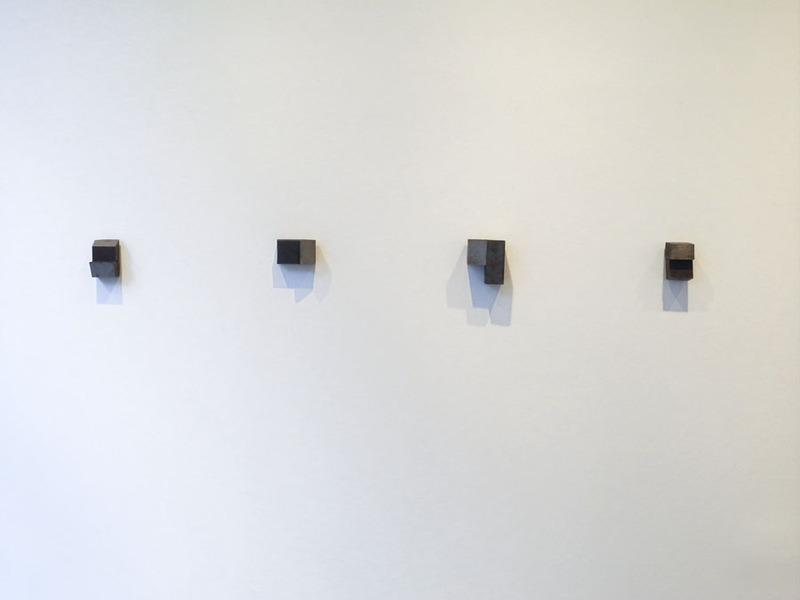 This series of compact works uses a vocabulary that shifts from one piece to the next, all dealing with shifting planes. The surfaces are varied in color and in surface finish, making the simplicity of form more complex. 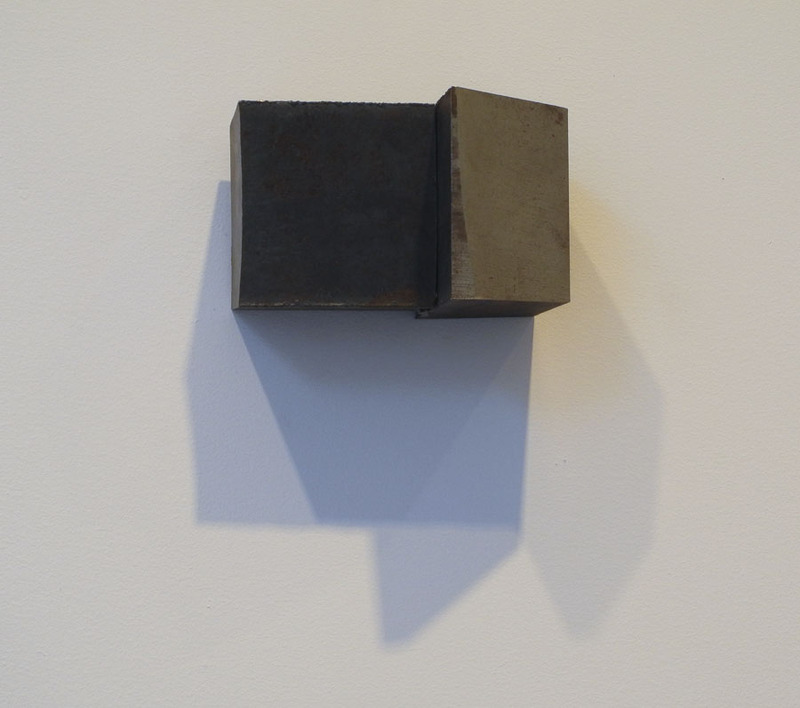 Untitled, 1990; steel, 8 x 6 3/4 x 5 in. 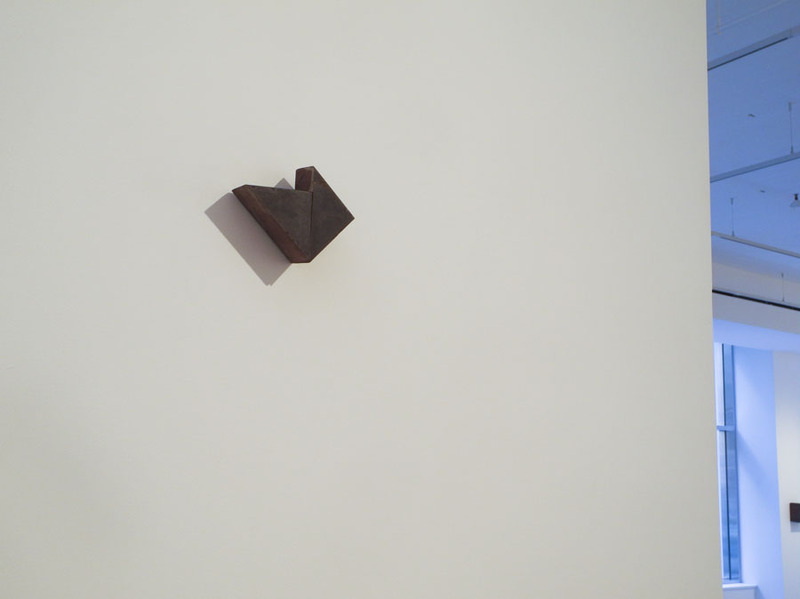 This small floor piece brings to mind one of Joel Shapiro's house sculptures, but while the Shapiro is a self-contained image, the Nonas work has a deeper and more mysterious resonance; although weighty, the reddish forms also have a floating quality to them as the triangle points upward, rising in the space. 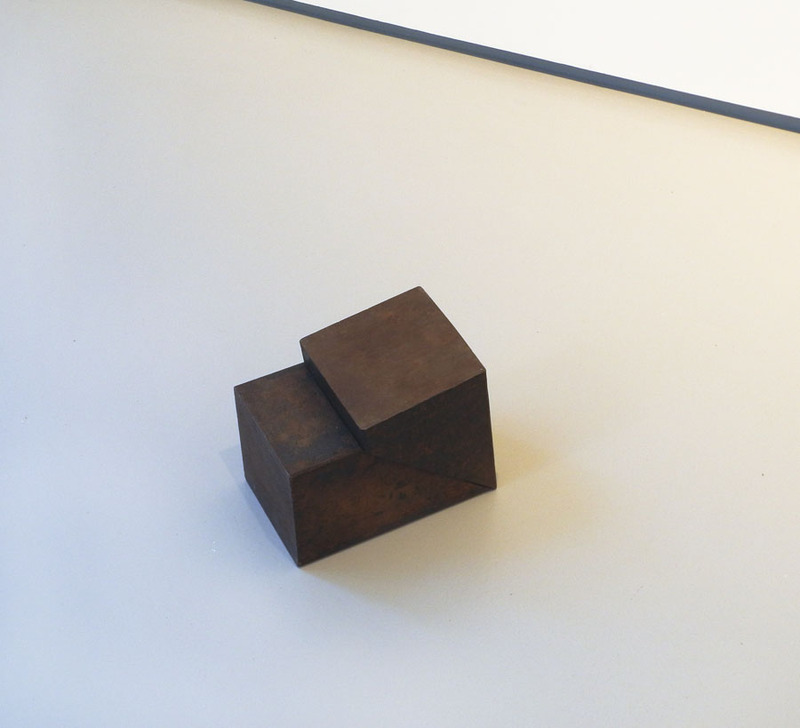 Untitled, 2003; steel, 7 x 10 1/2 x 1 1/2 in. What could be more direct, more ordinary, than a group of sliced cylinders? They could almost be pieces left over from a construction project. 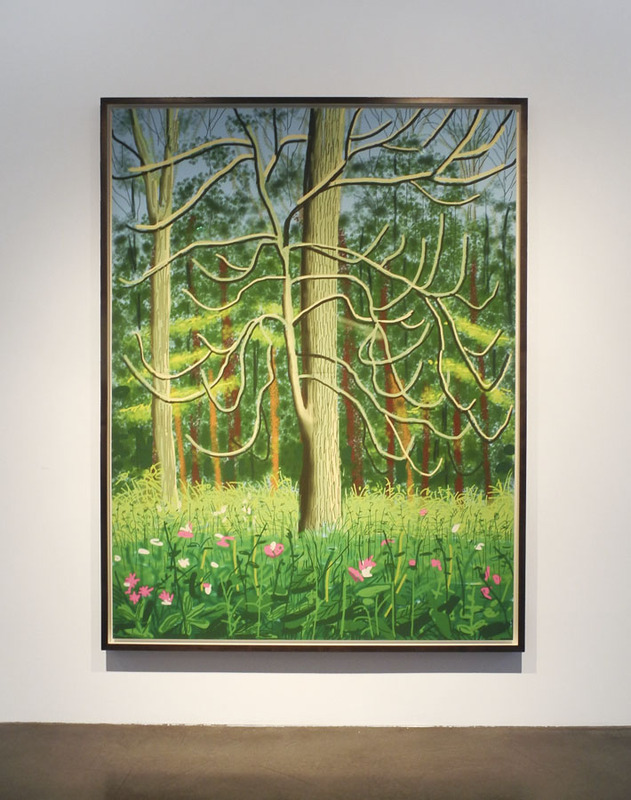 In lining them up in such a deliberate way, Nonas makes something poetic of them; curving elements that could roll across the floor are instead huddled together, the pattern of their repeated ellipses giving a sense of movement. I think this might have been my favorite work in the show; it touches me: there's a vulnerability expressed in these hard forms. Crude Thinking 1, 2005-2007; wood, 34 1/4 x 37 1/4 x 9 in. Crude Thinking 5, 2005-07; wood, 31 x 41 x 9 in. 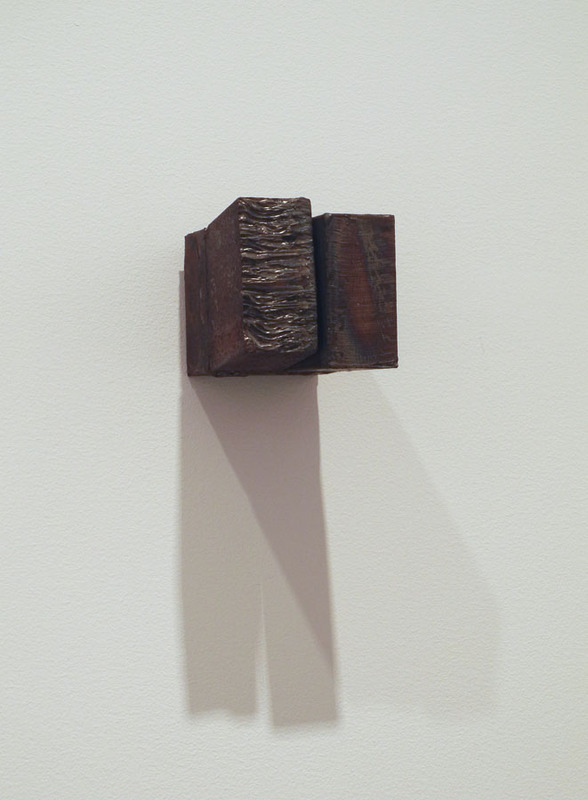 There were several wood pieces in the show, including these two titled Crude Thinking. I suppose that putting together 3 slabs of plain wood could be considered crude, but Nonas' perfect sense of form and balance turns them into satisfying objects of contemplation. Larger than the steel pieces, they have a more commanding presence on the wall; at the same time they are softer and warmer, wood being a living material. It may seem surprising that I would feel so moved by sculpture that is so stripped down, so elemental, but that is exactly its appeal: in clear and simple forms is a sense of the underlying reality of the world, its essential character. Nonas aims towards that. ....the scent in the air is spicy-sweet, a smell particular to fall. 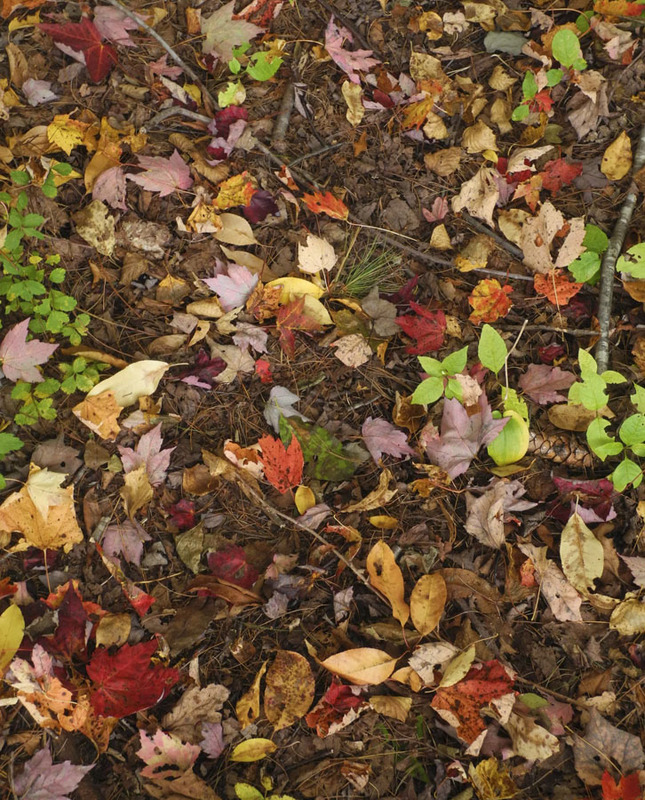 You can sniff, sniff, sniff, trying to place the smell, as though you are in an exotic spice shop, but it is just the smell of the fall woods. I assume it comes from the decaying leaves that cover the ground, and what a delightful outcome from decay. I so wish there was a way to share smells, like there are images and sounds; maybe some day we'll be able to do that, a scratch and sniff for the computer. 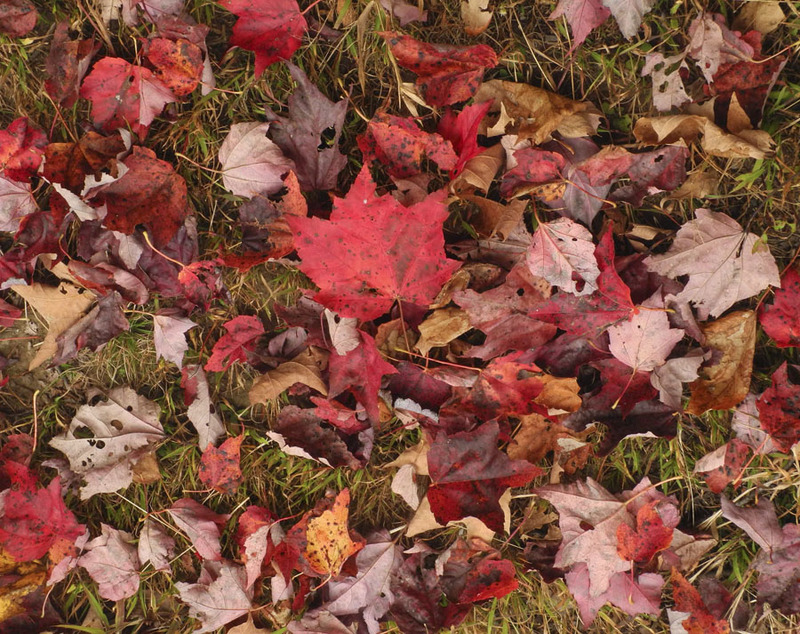 As I walk the path, I have the visual beauty of colored leaves above and below, the amazing aroma, and the sound of my feet brushing through the drying leaves; that sound reminds me of a childhood delight: crashing through large piles of fallen leaves in Brooklyn, scattering them, tossing them, a raucous celebration of the season. My fall fancies are now quieter, but just as appreciative. The color is fleeting; the paths will soon be dun. 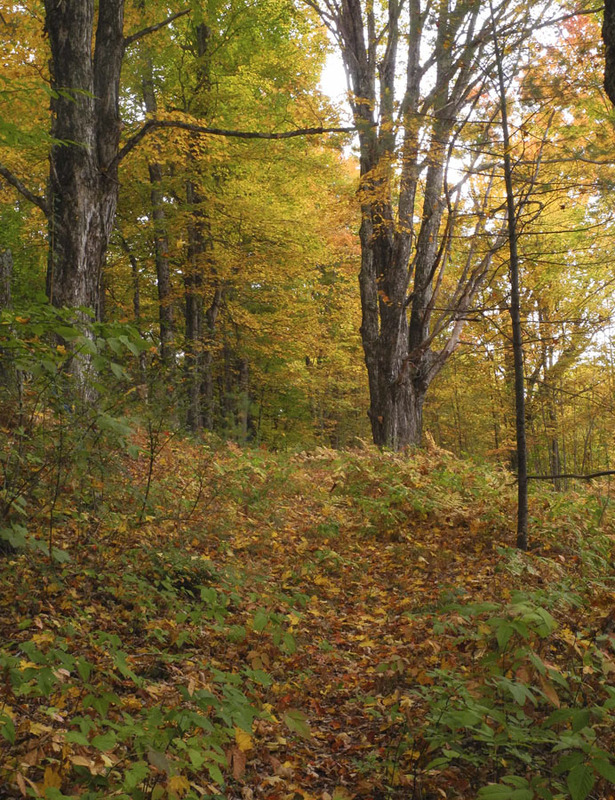 The special scent of this season's woods will become a memory, as the cold and quiet of winter begins to set in.